Camden Villas at Mid South Club is an active lifestyle community in Southern Pines, North Carolina. Situated in the Pinehurst area, Camden Villas is one neighborhood located within the gates of a master-planned golf course community, Mid South Club. Homebuyers are attracted to its low-maintenance homes developed by a well-known and trusted builder, Epcon Communities. Residents of Camden Villas in NC enjoy living within close proximity to dozens of golf courses in the Sandhills where they have the opportunity to have a membership to two amazing golf courses. If golf isn't your main focus, homeowners also have access to their own private clubhouse in addition to Mid South Club and Talamore Golf Club. Within the Camden Villas community, residents enjoy exclusive use of a welcoming clubhouse that s richly appointed with a fireside lounge and large multi-purpose room complete with a billiards table, catering kitchen, and tables for activities. Residents can work out indoors with cardiovascular and strength-training equipment in the exercise room or outdoors by taking a stroll along the beautifully landscaped trails. Property owners can obtain memberships to two legendary golf clubs that make up the Talamore Golf Resort. The first of which, Mid South Club, has a spectacular 25,000 square-foot clubhouse filled with amenities. It includes a multi-purpose room with a kitchen to cater a variety of events and social activities. There is also a restaurant, dining room, and a members-only lounge. You'll often find residents enjoying the great outdoors by golfing on the 18-hole course designed by Arnold Palmer, playing tennis on one of the two courts, enjoying a meal on the clubhouse patio, or relaxing in a resort-style pool and spa. The second club, Talamore Golf Club, was designed by Rees Jones. This 18-hole course was made famous by introducing the first llama caddy program and still offers the tradition today. Its 11,000 square-foot clubhouse includes a bar and grill, main dining room, and poolside cabana/hospitality suite complete with card tables and a kitchenette. Outdoors, residents can barbeque at one of the picnic shelters, host parties on the patio, or swim laps at the pool. Epcon Communities began construction of Camden Villas at Mid South Club in 2007. When it was completed in 2017, it included 58 thoughtfully designed homes that overlook picturesque golf course fairways. Homebuyers enjoy main-leveling living without having to give up quality construction and open floor plans. Homebuyers can find an attached home that offers between 1,750 and 2,240 square feet of living space. These feature first-floor master suites and include two to three bedrooms, two to three bathrooms, and an attached two-car garage. The attached models offer floor plans that include a screened or glass veranda as well as an optional private patio. There are a few detached homes within the community that have between 1,776 and 1,956 square feet of living space. These models have two to three bedrooms, two to two-and-a-half bathrooms, and an attached garage. Detached single-family homes include private courtyards, ideal for hosting a family barbeque or gathering of friends. Without having to worry about the constant upkeep of exterior home maintenance, residents have more free time to utilize the clubhouse amenities and attend community parties where neighbors become lifelong friends. Whether enjoying a round of golf, starting a book club, or attending a holiday party, Camden Villas residents are always planning fun events. Outdoor adventurers will be pleased to know that they're close to Reservoir Park's two-mile nature trail system as well as fishing and boating on a 95-acre lake. 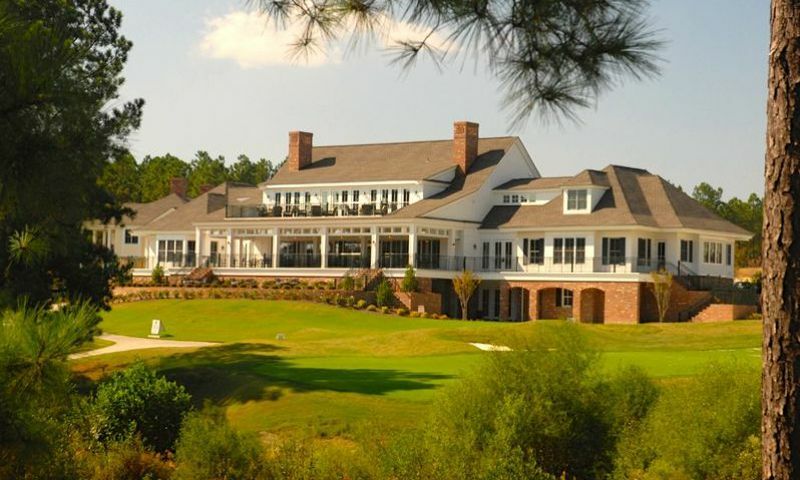 Camden Villas at Mid South Club is located in Southern Pines, NC. This Moore County neighborhood in Central North Carolina is situated in the Pinehurst area. Besides its well-known golf courses, Pinehurst has plenty of attractions like the Sandhills Horticultural Gardens, Pinehurst Harness Track, Village Shops at Pinehurst, and dozens of restaurants that range from fine dining to casual fare. This active lifestyle community is within a one-hour drive to attractions in Raleigh and Fayetteville and Charlotte is a two-hour drive. When you want to travel beyond North Carolina, Fayetteville Regional Airport is 47 miles away and the Piedmont Triad International Airport is 87 miles away. Homebuyers will enjoy Camden Villas at Mid South Club's convenient location in a private setting. Clubhouse - 11,000 Sq. Ft. There are plenty of activities available in Camden Villas at Mid South Club. Here is a sample of some of the clubs, activities and classes offered here. Homebuyers can find an attached home that offers between 1,750 and 2,240 square feet of living space. These feature first-floor master suites and include two to three bedrooms, two to three bathrooms, and an attached two-car garage. Attached homes include screened or glass verandas as well. There are a few detached homes within the community that have between 1,776 and 1,956 square feet of living space. These models have two to three bedrooms, two to two-and-a-half bathrooms, and an attached garage. Single-family homes include private courtyards, ideal for entertaining outdoors. So much new building going on so camden villas are outdated &midsouth club is trying hard to revamp. My wife and I bought a new home here in 2010 and it is fantastic. The quality is exceptional and we have not had any problems, can't say the same for other homes we've owned. We belong to the Mid South Club and it's worth every penny. The golf is outstanding and the clubhouse has tasty food, a great pool, tennis and a lounge. We also golf at Talamore every so often and that's very nice as well. Camden Villas is a great neighborhood and we would recommend it to anyone. 55places.com is not affiliated with the developer(s) or homeowners association of Camden Villas at Mid South Club. The information you submit is distributed to a 55places.com Partner Agent, who is a licensed real estate agent. The information regarding Camden Villas at Mid South Club has not been verified or approved by the developer or homeowners association. Please verify all information prior to purchasing. 55places.com is not responsible for any errors regarding the information displayed on this website.